I’m still pondering a memorial tree for my Dad, who died on September 2. Usually I can easily pick from my list of wanted trees. How best to honor his love of the countryside, birds, his (we think) Cherokee heritage, fishing, laughter, family, deer? Oklahoma state tree? A tree to attract birds? A climbing or swinging tree? Something with Cherokee in the name? Dad would have loved everything about our home on Whidbey Island and I wish we had been able to spend more time here together. It is largely due to Dad’s love of fishing that we live here. He had a fishing buddy with a cabin on the beach at Lagoon Point, which is just behind and below us in this picture. I have happy memories of the beach and sitting snug in the cabin while another buddy of his serenaded us with a guitar and”You are my Sunshine”. As a child I promised myself that I would either grow up to live on my grandparents ranch or move to Whidbey Island. 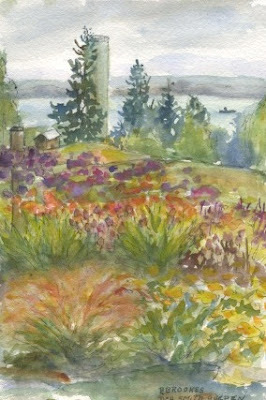 As we searched for property 11 years ago, I kept an eye out for the landmarks that matched the nameless location in my head – the road that hugged the bluff on it’s way to the beach and the view towards Marrowstone Island and the Olympics beyond. When we happened upon this property for sale, something in me said, “This is home.” It wasn’t until after we contacted the real estate agent that we rediscovered the bluff and beach of Lagoon Point right below what was to be our new home. I’m sure I will come upon the perfect tree soon. In the meantime, there is no better way for kids to honor their parents than by living well and being happy. I rake and roll the debris onto a small tarp, then drag the tarp to the tractor. It takes several trips with the tractor to dispose of it all. As I was driving, I thought, “Wow, I am almost sixty and I’m still gardening!” Nagging at the back of my mind is, “for how long?” Many of my friends don’t garden anymore and have moved to smaller places. I miss their gardens and I’m guessing they do too. I would like to stay in our home and garden as long as I can. And I’d love to see children or grandchildren keep our home as a get-away place. So I’m always thinking of how I can make this garden easier to take care of. Here are some of those ideas. Stay fit and flexible. Yoga and swimming have been my best allies. Warm up before going outside. Vary tasks. Quit before you are tired. My friend Michele does a victory lap around her garden, wine glass in hand when she is done for the day. Hire some garden help – even if for now you don’t need much. Develop a relationship with someone who comes to understand how you like to do things and gets to know your plants. Someone you could eventually trust your garden to in case you are ill and can’t get outside. Hire a knowledgeable professional and expect to pay him or her well. Or hire someone less experienced and plan to spend several years training this person. And then if you plan to keep this person, pay him or her well. Make sure there is work to do even during the winter. Cover the ground with plants. Weeding and mulching is time-consuming, expensive and hard on the back and hands. I am relying more on shrubs and using perennials as accents. Select plants that need less pruning, deadheading or dividing to look good. Place shrubs that get twiggy or perennials that spread in a section of the garden you could your “wild” area. Choose plants that match the cultural needs of your garden and you won’t need to coddle them. Dragging around hoses is hard work, so use drought resistant plants whenever it is appropriate. Consider installing an irrigation system to get the plants off to a good start, but in the long run even this needs monitoring and repair. Be judicious in your use of low “ground-covers.” In a small garden or an in-town garden they are fine. In my garden, open to forest and field they become a huge chore as weed seeds land and sprout between the runners of the groundcover . I use shrubs at least 1’ tall as groundcover – something I can lift the skirt, reach under and pull the weeds. Contrary to the sound bites I hear nowadays, I think lawns are much easier to take care of than planting beds especially if you don’t expect your lawn to stay green over the summer or be weed free. Think about how much easier it is to run a lawn mower over an area than it is to weed the same amount of space. I mulch our lawn clippings so I don’t fertilize either. And hiring someone to mow is also easier and much cheaper than hiring someone to weed, prune, deadhead, etc. . . .
We gathered greens for wreaths the weekend before Thanksgiving. It was especially important to do it early this year as our daughter Amie and family were due to go out of town the week before Christmas and I like to send a bit of home to her in Utah. We loaded the tractor bucket with pruners, hand saw and loppers and came back with grand fir, spruce, salal, evergreen huckleberry and red huckleberry – all from our own five acres. We also cut some branches of our ailing corkscrew willow. I keep saying I’m going to take it out since it’s so unsightly most of the year, but at wreath-making time I relent since the yellow twisting branches are fabulous for accent. I also love the red huckleberry because the new buds remind me of tiny red Christmas bulbs and the chartreuse stems are a nice contrast to the dark conifer greens. Thanks to a fierce storm earlier that week we were able to pick up fallen limbs of Douglas fir that I use as the base material and the lichen covered alder branches I covet for accent all along our little dirt road. The deer also did me a favor and thrashed the bottom of the neighbor’s giant sequoia into just the right sized branchlets. Amie got her wreath in enough time to enjoy it and Alison, our younger daughter who lives closer made two wreaths. But my own wreath just sat on a list of to-dos the whole month of December, and the wreath-making machine glared at me every time I went out the laundry room door. I finally set aside some time Christmas Eve day. I was a bit dismayed to find that the greens I had efficiently cut into smaller branchlets and stored in the garage a month ago had dried out. So had the promising garrya with the silvery tassels. But I still had some very large branches left and the cuttings from those were nice and fresh. Good to know. As I worked, part of me wondered if I should put my feet up for a long winter’s nap instead. The scent of those greens however took me back to a favorite memory. Every year – together – my too-busy, bickering parents decorated the outside windows and doors of our house with C-9 lights and greens. To gather material, they tromped into the forest that surrounded our house and left me at home in charge of my younger sister and brother. The “woods” where we and our neighborhood friends built forts, damned creeks and picked berries seemed a kids-only kind of place so their going there was temporarily confusing to me – as if they wouldn’t be able to find the magic door. An hour or so later they would come back, red-cheeked and laughing. Mom would make a thermos of coffee and they would spend the next few hours – together – somehow attaching those greens to a brick house. Not without a few choice words from my father. Santa always brought an embarrassment of riches to my brother and sister and I. But one of the sweetest gifts is this memory reopened every year by the scent of Christmas greens. Plants in the box (from Bayview Farm and Garden Nursery) need some time and warmth to start filling in. The crew from Art of Soil took special care to plant all the boxwood roots at the proper depth. We will wait to trim foliage to the same height once they’ve had time to settle in and start growing new roots. Arborvitae hedge needs some staking just like other trees until the anchor roots get established. And the patio furniture can emerge when it stops raining! There’s a temptation to keep tweaking to make it perfect. But what’s really needed is the magic and time that only Mother Nature can provide. And our patience. Good thing we have a tractor! Some unexpected sunny afternoons find me outside gardening already! I always give myself the psychological boost of tidying the entry garden first since that’s what I and my guests are most likely to see. I pulled shot weed, cut back perennials and grasses, combed out the dead foliage from some evergreen grasses, cut back last year’s foliage from hellebores and epimediums. I also pruned the lonicera hedge. I hemmed and hawed over what to do about the gold hardy fuchsia. Considered a somewhat tender sub-shrub, the naked branches protect it, so pruning it now is a risk (especially with cold weather coming this week), but it is so much harder to prune later in the season since I have a clump of narcissus coming up right underneath it. So I chopped it to the base and hopefully it will rise back up to its 3’ height come summer time. I noticed the deer are getting desperate, so I sprayed the usual victims plus the hedge and euphorbias – wow they really are hungry! It is obviously not yet time to take the rebar stakes away from conifers and shrubs. I noticed my soil is much less soggy this year, but even so I try to avoid unnecessary stepping in the beds this time of year since it can compact the soil. The temptation is to try to do everything while the sun shines, I’m suited up and armed with all my tools, but I know better. I left the roses for later in February and hydrangeas for March. I remembered to vary activities, stretch and quit before I was too tired – good for me. Because next on the list is pruning fruit trees. And maybe I’ll have enough energy to cut some branches for forcing indoors. Poppy – keeping an eye out for deer. Two years ago, we planted a Liriodendron tulipifera / Tulip Tree to honor the marriage of our daughter A. and son-in-law, T. A loves all kinds of magnolias and their relatives and they had a huge Liriodendron in their backyard in Brooklyn, NY. They lived on the third floor of a brownstone so they could see into the blooms at the top of the tree that most often go unnoticed from down below. Another daughter, another A. married son-in-law S. this July. This past weekend we planted Quercus robur / English oak in their honor. Unbeknownst to each other, they both spent time in England as young adults, at the same time! Both were English majors and have interests in British history and poetry. S. requested that the tree be big enough to hold a swing for children or grandchildren. I don’t know that I can deliver on that one – I planted the biggest specimen I thought would survive and flourish in our landscape. For a now, we’ll just have to build a swing next to the tree. We said good-bye to our beloved golden retriever, Bunter this summer. In remembrance of her, we planted Cornus ‘Starlight’ / dogwood in the corner of our property where she liked to chase rabbits. ‘Starlight’ is a cross between our native dogwood, Cornus nutallii and Cornus kousa, noted for high resistance to the diseases powdery mildew and anthracnose. Next year there will be white summer flowers, showy fruit and fall color. We’re looking forward to the birth of our first grandchild, a boy at the end of the year. I’ll think about what to plant for him while I’m out watering the trees. . . . The simple form and association with meadows make asters a must have in our garden. I also appreciate the late season boost of color. Asters are sun-loving and require good drainage – but don’t make the mistake of letting them dry out or they are prone to mildew. I pinch asters back in early summer but still stake them as they inevitably flop and don’t live up to their potential. I’ve been able to keep the rabbits at bay by spraying. So far the deer don’t seem interested. Slugs can be a problem early in the spring. I’ll be looking to add more asters, particularly A. laevis ‘Calliope’ with purple tinted stems, purple blooms with yellow centers ‘ and A. lateriflorus ‘Prince’ with purple-black stems and small white blooms with a pink center. Aster x frikartii ‘Monch’ started blooming earlier than most other asters and is almost finished here. It is shorter (2-3′), self-supporting, hasn’t been even nibbled by the rabbits and deer here and since it is blue, is my favorite aster. Aster nova-angliae ‘Alma Potschke’ is a later bloomer (still blooming here), 3-4′ tall with a striking color in bud and bloom. Aster nova-angliae ‘Treasure’ is also a later bloomer (still blooming here). It grows to 3-4′ tall. Look carefully and you can see the grow-through plant supports that work particularly well with asters.